also taught at Princeton and at Harvard. 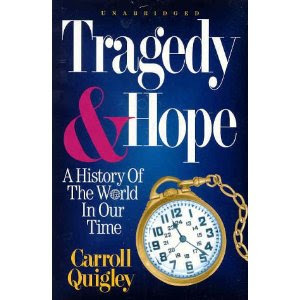 His 1300 page book "Tragedy and Hope" is unique among other history books in its exposure of the role of International Banking cabal behind-the-scenes in world affairs. He does not spend a lot of time explaining what he calls "unorthodox" financial methods as opposed to "orthodox" financial methods which can be be distinguished by the fact that "orthodox" finance has governments allowing banks to create the money and then borrowing that money from them at interest to create massive growth of public debt whereas "unorthodox" finance has government Treasuries create the money and borrowing that money from the Treasury without interest to create a stable debt where all payments go against the principal. The recurrent theme of these historical texts is the oppression of the poor by the International bankers. When I speak of Rothschild and Rockefeller (R&R), I am treating them as the epitome of the parasitic usurer families for according to the golden rule, those who have the gold makes the rules and throughout most of recent history, the Rothschild and Rockefeller families have been the most prominent owners of the gold. Blame for all the genocides and most murders of recent history can be laid at their feet though it is a responsibility shared by their banker cronies the world over. I know that if Christ came back and had a whip in hand, it's these moneylenders he's go after, once again. point where the poor strike or riot rather than face starvation quietly. Quigley, on a regular basis, mentions orthodox versus unorthodox financial methods without ever detailing the unorthodox methods responsible for the happiness of the citizens though he goes into great depth about the orthodox financial methods which result in such oppressive misery. Whereas orthodox financial methods can be best explained as government licensing private banks to create the money and then borrow it from them at interest whereas unorthodox financial methods can be best explained as government Treasury creating the money and paying no interest to middlemen.